Carol's Theatre Reviews ~ It's Fun To Go Out: The Boys Are Back in Town, And OH! What a Night it was. The Boys Are Back in Town, And OH! What a Night it was. It all began under a streetlight in New Jersey in 1956 with handshake and four street urchins calling themselves musicians who wanted to start a singing group. 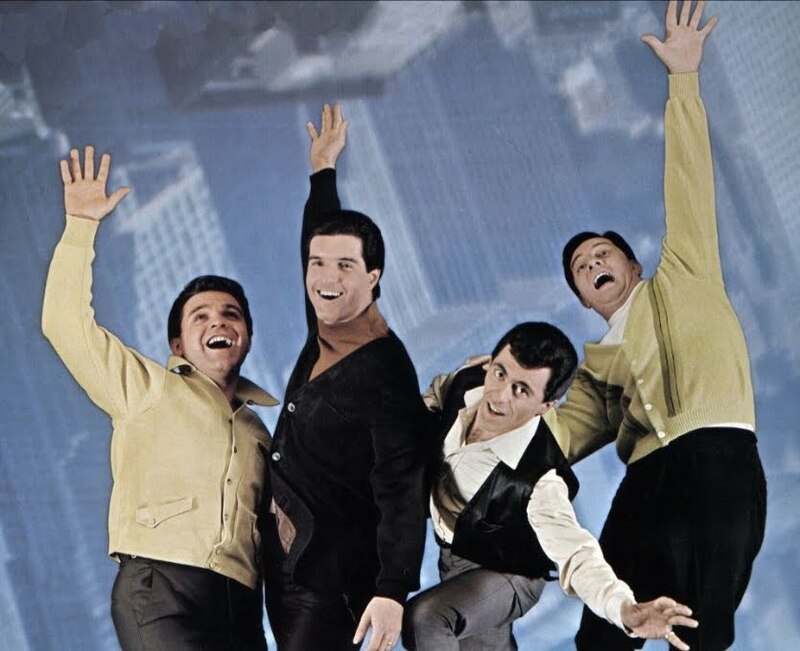 By 1962 the four musicians, Tommy DeVito (Mathew Dailey), Nick Massi (Keith Hines), Bob Gaudio (Cory Jeacoma) and Valli (Aaron De Jesus) scrambled for gigs in coffee houses, bowling alleys, lounges, bars and small time diners and eventually settled on calling themselves ‘The ‘Four Seasons’ after performing at a Bowling Alley of the same name. Before that they were ‘The Four Lovers’. That morphed (after trying out about a dozen or so different names to call the group) into the ‘Four Seasons’ and finally to “Frankie Valli and The Four Seasons”. In 1990 the original ‘Four Seasons’ were inducted into the Rock ‘Roll Hall of fame and in 1990 joined the Vocal Group Hall of Fame. Still one of the best-selling musical groups of all time, they have sold over 100 million records worldwide. The two-time Tony Award winning show (2006) is now here at the Civic Theatre through May 14th. It traces the early beginnings of what is now headlined as “Frankie Valli & The Four Seasons”. The story plays out like an emotional roller coaster for the boys and their rise to fame leaving some behind and others with broken marriages as the four tell their stories, each taking a season, during and toward the end of the show bringing us up to date on the whereabouts of each of the singers. It’s an honest to goodness rags (read small time hooligans and oft time petty thieves) to riches story warts and all that also included stints in prison for petty theft, etc. With the combined efforts of McAnuff who directed, Marshall Brickman and Rick Elice (book), Bob Gaudio (music) and Bob Crewe (lyrics) with Sergio Trujillo choreographing and starring Aaron De Jesus as Valli, most of what we see is based on their story and their somewhat slow and oft times frustrating rise to fame. 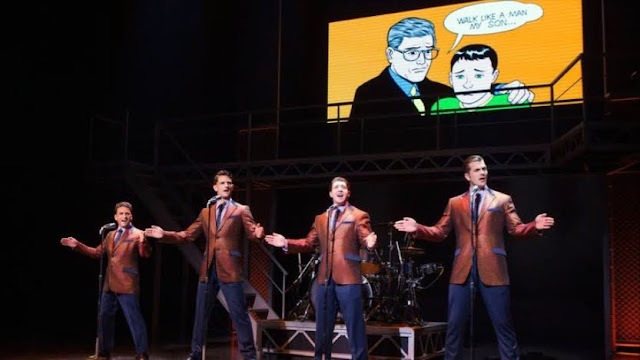 By now, after ten years on Broadway and countless touring shows, “Jersey Boys” is a glitzy well –oiled, high energy machine that like the Ever-ready Bunny continues to entertain. Howell Brinkley lighting design, costumes by Jess Goldstein, Klara Zieglerova scenic design and Michael Clark’s comic book projections; all are pretty much in tact. It’s thoroughly entertaining and well worth seeing (for this reviewer at least four times including the one in Vegas). In this current production, aside from De Jesus who gives us an unbelievably outstanding performance as his character matures right in front of our eyes, his strong falsetto voice is on target. He’s pretty versatile as well with some very good -looking dance moves with a low center of gravity that allows him to spin on his knees as well as slide onto the edge of the stage with microphone in hand singing. Baritone Matthew Dailey (Mr. tough guy) plays Tommy DeVito the troublemaker and racketeer who puts the group in a tough situation after racking up over a million dollars in debt, for which Valli pledged to pay back. Dailey’s tough guy character is consistent throughout. He’s the guy you love to hate for putting the group at risk of losing everything with his small that turned into big-time gambling debts. Bass Keith Hines is Nick Massi the easy going of the group who suddenly decides to leave just because he said it and didn’t want to backtrack. His dry sense of humor and monotone delivery, brought laughs every time he spoke. Tenor Cory Jeacoma is Bob Gaudio. He is brought into the group by none other than Joe Pesci another New Jersey native and friend of Valli’s. When Gaudio came into the group he literally pulled them out of the doldrums with his songs, “Sherry”, “Walk Like A Man”, “Big Girls Don’t Cry” and “Can’t Take My Eyes Off Of You”. His specialty is on the keyboards. The harmony works as well with this talented cast in what looks as though all are playing their own instruments. Strong support comes from Barry Anderson as Bob Crew their on again off again producer, Thomas Fiscella as Gyp De Carlo one of Jersey’s gangsta’s and Jersey Girl Kristin Paulicelli who plays Frankie’s first wife Mary. The women in the show are more for background looks rather than pushing the story forward. It’s glitz with nowhere to go. But glitz is what past present and future productions are/will be about when all is said and done. If you haven’t seen “Jersey Boys” in person or the movie version, see it while its here. With popular hits like “Walk Like a Man”, “Big Girls Don’t Cry” “My Eyes Adored You”, “Earth Angel”, “Sherry”, “My Boyfriend’s Back” “Oh What a Night”, “Who Wears Short Shorts” “Sunday Kind of Love” and a beautiful solo by Aaron DeJesus’ Frankie, “I Can’t Take My Eyes Off Of You”, for sure you will be one of thousands who crowded into the Civic Theatre on opening night and went gaga over every song the group and the band sang and played.